Like all sports, the NHL (National Hockey League) goes through rule changes from season to season. NHL standard rules are in place to keep the game safe, and make the game more fun to watch. 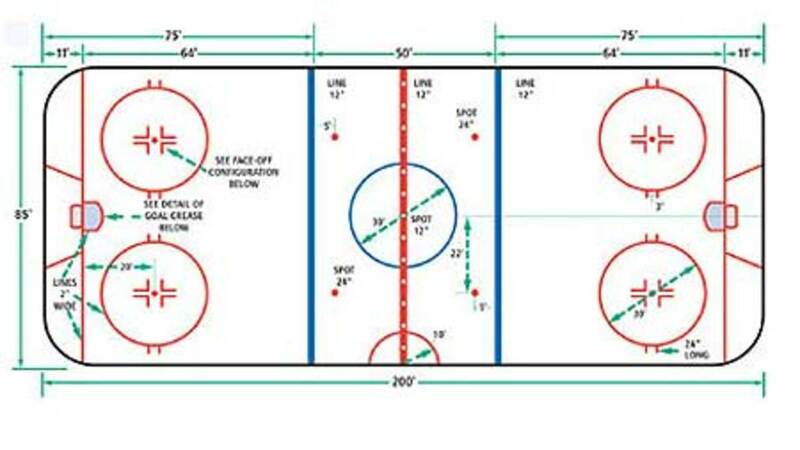 So lets start with the layout of the ice. As seen in the graphic above, there are different colored lines, as well as circles. As would be expected, each of these have significance, and have at least one rule tied to how it effects the game. Center Ice/Face-Off Circle:Ai? ?The face-off circle at center ice is where the puck is put in play (dropping the puck) by the referee at the start of each period and after a goal is scored. During the dropping of the puck, only one player from each team may be in the center ice circle. Once the puck is dropped however, teammates from both teams can enter this area to assist in controlling the puck for his team. Neutral Zone:Ai? ?The area between the blue lines indicating each teams’ defensive zone. Neutral Zone Face-Off Dots:Ai? ?Four dots in the neutral zone where a linesman can drop the puck after a stoppage of play. Blue Line:Ai? ?A solid blue line spanning the width of the ice which indicates the border between the neutral zone and a given team’s defensive zone. Slot:Ai? ?The area directly in front of the goal tender, between the two defensive zone face-off circles. The “high slot” is an area of the slot that is farthest away from the goal, closer to the blue line. 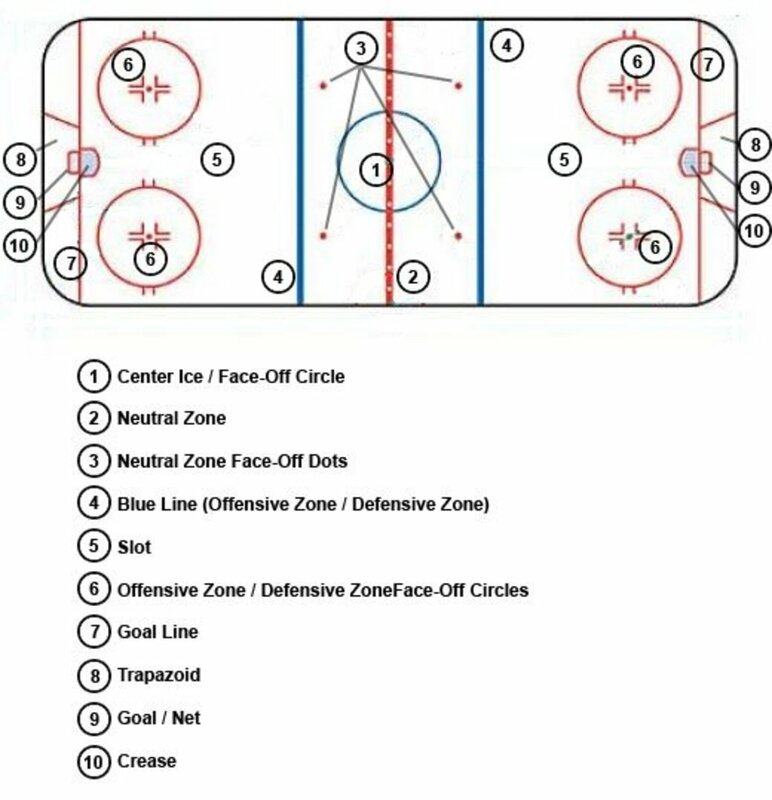 Offensive and Defensive Zone Face-Off Circles:Ai? ?Two large circles in a given team’s zone where a linesman can drop the puck to restart play. There are four on the ice; two in a team’s offensive zone and two in that team’s defensive zone. Given that each team has an offensive zone and a defensive zone, there are only four of these circles on the ice. I must state the obvious that one team’s defensive zone is the other team’s offensive zone. Goal Line:Ai? ?The red line spanning the width of the ice on which the goal sits in each zone. Trapezoid:Ai? ?The area directly behind the goal in which it is permissible for the goal tender to touch the puck. Goal/Net:Ai? ?Goals sit on the center of each goal line in a team’s defensive zone. Icing:Ai? ?This is one of the two most misunderstood calls in hockey. The rule is that if the puck is passed into the offensive zone by a team from their side of the red center ice line, and it is either not touched or could not be determined “touchable” before it passes behind the goal line in that team’s offensive zone, then the puck has been “iced.” The play will stop in most leagues such as international, collegiate, and amateur play without the need for the defense to touch the puck. In the NHL, play will not stop until the defense touches the iced puck. This gives the offense a chance to get to the puck first. If the iced puck is touched first by the team that iced it (the offense), then play will continue. Off Sides:Ai? ?This is also misunderstood sometimes. Off sides is really not that hard to follow if you remember one thing; the puck always has to be in the offensive zone before the offensive players. There is one exception; a defensive player can put the puck back into his own zone while the other team has offensive players in his zone. Off sides is waived off and the offensive players can touch the puck with no consequence. Hand Pass:Ai? ?Before explaining hand passes (which really is self explanatory), at no time during play can anyone close their hands on a puck. That will be discussed in a later topic where minor penalties are explained. So, to pass a puck with a swinging motion of a player’s arm (like a baseball bat), or to push the puck along the boards or ice with any part of the arm or hand is considered to be a hand pass. Hand passes stop play if the puck is touched by a player of the same team as the one who committed the hand pass. Hand passes are considered legal only if a defensive player does a hand pass in his own zone. The puck will be dropped in the neutral zone on a face off dot closest to where the puck was touched after a hand pass. Puck Over Glass:Ai? ?Simply put, the puck leaves the rink and ends up in the spectator seating. There are times that this can be considered a minor penalty, but again, we will get into that later. For this variety of play stoppage, if the puck leaves the rink, the face off will then happen as close to where the player was when he put the puck off the rink. Puck Touched by a High Stick:Ai? ?This is a simple rule to see and understand. If the puck is touched by a stick above the player’s shoulders, it has been played with a high stick. If this occurs, play will stop if the next player who plays the puck is on the same team as he who touched the puck with a high stick. Also, if a goal is scored by a player who last touched the puck with a high stick, that goal will not be counted and the face off will come to the face off circle or dot closest to where that player was standing at the time of the high stick. There is no grey area for this call. If the other team controls the puck after the incident of a high stick, and play has not yet been halted (meaning the same team has not touched the puck), then the high stick infraction is waved off and play will continue. Puck Kicked in Net with Distinct Kicking Motion:Ai? ?In hockey, sticks get dropped, broken, tangled with other player, etc. So, players are trained to develop the ability to kick and control the puck with their feet. Kicking the puck is very common and is often used by skilled players to trick other players all the time. No matter how fancy a player’s footwork is, it is not allowed to kick the puck in the net intentionally. This is not saying that a puck that is scored off the feet of an offensive player does not count. The rule is stated that the puck can not be scored with a “distinct kicking motion.” Players may angle their feet with the intent of deflecting the puck in, as long as it does not appear that their feet move in a kicking motion. Officials have spent considerable amounts of time reviewing goals scored off of players’ feet to determine if they were “kicked” into the net. In the event of the non-kicking motion goals, they will count (subject to the opinion of the referee and official staff reviewing the goal.) However, in the case that the staff feel that the puck was kicked in with the motion of a kick, the goal will not be counted and the face off will come to the closest face off circle or dot to where the puck was kicked.Ai?? Goal Tender “Freezes” the Puck:Ai? ?I have included this event in this section only because the whistle will blow and play will stop. In hockey, the only person who can stop the puck on the ice, catch it and close his hand on it, or pin it in clothing and equipment with the intent to stop play is the goalie. The goal tender can and often does stop play when the opposing team is threatening to score. Referees are instructed to stop play once they lose site of the puck under a goalie. Unlike soccer where the game clock continues to run even if the goal tender has the ball, hockey game clocks will stop and the puck will be dropped in a face off circle close to that goal tender to resume play upon goalies freezing the puck. To start, penalties are stoppages where players do personal offenses against other players. In the event that a penalty is to be called and play is to be stopped, a referee will raise his hand above his head. He will then wait to stop play until a player from the offending team touches the puck. The referee waiting for this touch up is known as a delayed penalty. During this time, teams often will have their goal tender rush to the bench to get an extra offensive skater on the ice to try to score during the delay. Penalties will result in the offending player sitting in a penalty box for an alloted time. This period of time is know as a power play. The team of the offending player can not put a player on the ice to replace the penalized player (teams are allowed 6 players on the ice during regulation play, usually 5 players and a goal tender.) During the power play, the team of the penalized player will then be down a man resulting in a 5 on 4 advantage for the other team. There are often times that teams can be down two players resulting in a 5 on 3. Other combinations are 3 on 3, 3 on 4, and 4 on 4. No matter how many players are in the penalty box for a given team, the fewest number of players a team can be restricted to is 3 skaters and their goal tender. Minor penalties that have caused one team to be shorthanded can end early if the team with more players (on the power play) scores a goal. Then the penalized player with the least amount of time can come out. Any remaining players with time remaining are to remain in the box. For example, if there is a 5 on 3, and player 1 has 20 seconds left while player 2 has 50 seconds left, and the team with 5 players scores, then the face off comes to center ice. A 5 on 4 will result for the next 50 seconds and the player who had 20 seconds left on his penalty will be permitted to leave the box before the face off. Otherwise, if the time were to expire naturally, and no goal is scored in the period of time during the penalty, then play continues as the penalized player will come out of the box to continue play. High Sticking (2 or 4 min):Ai? ?High sticking is a minor penalty where a player’s stick makes contact with any part of an opposing player above the shoulders. Intent has nothing to do with most minor penalties. In the case of a player’s stick, they are to always be in control. Even if someone else causes a high sticking penalty, there is no argument and no grey area. High Sticking is a 2 minute minor offense. However, if blood is drawn by a high stick, the time will be counted as two minor penalties in a row. Because it is determined as two minor penalties, if a goal is scored in the first 2 minutes, then the rest of that 2 minute period is removed and the second minor is started. If a goal is scored in the second 2 minute period, then the player can come out of the box and continue play. Tripping (2 min):Ai? ?Tripping is the act of taking down an opposing player by taking his skates out from under him. This can be done with a stick, skate, arm, or other part of the player’s body and/or equipment. Boarding (2 min):Ai? ?There are two varieties of boarding. The minor (2 min) version is a mild act of attacking a man from behind into the boards while in a defenseless position. This rule was created to protect the health and future career of NHL players. Players are allowed to run into (aka: check or checking) other players who have or are close to obtaining the puck. Players who are hit from behind into the boards around the rink are considered defenseless. The referee will judge whether the hit into the boards was malicious or not. If he feels it is an offense but not a major penalty, it will be a 2 minute minor. We will talk about the major penalty version later. Goal Tender Interference (2 min):Ai? ?Players are allowed to check other players as long as the puck is close, and it is not an unnecessary hit. There is one exception. Players are never allowed to check the goal tender. In recent seasons, players have found ways to interfere with a goal tender without actually checking him. As a result, a new definition of goal tender interference was adopted. Players must make all efforts to avoid contact with the goal tender while he is in the crease (the blue paint in front of the goal.) Players are also prohibited from facing the goal tender and waving in his face or other acts of distraction. It is permitted to stand in front of the goal tender and screen (block his vision) as long as he does not make contact or distracting motions. Like most rules, the referee can call things he sees as interference or have play continue based on his discretion. This is a very hard rule to always uphold. Many teams feel that their goal tender is interfered with more often then it is called by officials. Interference (2 min):Ai? ?Unlike goal tender interference, contact with other players on the ice is as much a part of the game as ice skating. Hits, checks, and contact happens continuously throughout the course of the game. Although contact is legal, every player is supposed to have an equal chance to get to the puck. This being said, interference is described as impeding an opponent who does not have the puck, or impeding any player from the bench. Diving (2 min):Ai? ?People fall throughout the game but diving is called when a player embelishes a fall to try to draw the attention of the officials. If a player gets tripped and an official feels the nature of their fall was a deliberate attempt to get attention, then he will serve 2 minutes. Delay of Game (2 min):Ai? ?Delay of game is somewhat of a blanket penalty that can be called if a player tries to waste time or draw a stoppage of play by either laying on the puck or putting the puck off the ice and into the stands from the defensive zone. Too Many Men on the Ice (2 min):Ai? ?Hockey is such a dynamic sport that players are coming off the bench and into play while the game is still playing. Since players are jumping off the ice and being replaced on the fly, there is bound to be some extra players physically touching the ice while the game is going on. This penalty is called when too many players are on the ice playing and are not in the act of coming off the ice. Players can get caught on the ice if they are trying to jump onto the bench and they inadvertently touch the puck with their feet, stick, or some part of their equipment after their replacement has already entered the playing surface. No matter how inadvertent this last action is, they are still considered in play and effected play as an extra man, therefore, they are penalized for too many men. Cross Checking (2 min):Ai? ?As mentioned before, contact is part of the game. There are certain types of contact that are potentially dangerous and considered penalties against players that use these forms of contact. Cross checking is when a player uses his stick with two hands and forcefully pushes another player by extending his arms, resulting in his stick hitting the opposing player. In other words, the player punches another with his stick. Slashing (2 min):Ai? ?Continuing the illegal stick usage penalties, we move on to slashing. This is the use of the stick in action similar to that of a baseball bat aimed towards the stick, legs, arms, or body of an opposing player. Stick checking is legal and can be similar in motion to slashing. Slashing is usually intended to distract or injure, and at times does the latter. Holding the Stick (2 min):Ai? ?Each player is responsible for his own stick, and at no time can they hold anyone elses’. Preventing a player from gaining access to the puck by holding his stick will result in a visit to the penalty box for 2 minutes. Hooking (2 min):Ai? ?Going back to what you are not allowed to do with your stick, we come to hooking. Hooking is defined as grabbing a part of an opposing player or part of his equipment with a stick parallel to the ice. Holding (2 min):Ai? ?Holding is when a player grabs or hangs on another player. This is often called as interference. Ooffenses such as hooking and tripping are also often labeled as types of interference..
Roughing (2 min):Ai? ?This is usually when players push excesivly after plays are over, or if the referee feels a particular hit was unneccessarily rough. There are other minor penalties that are not as common. 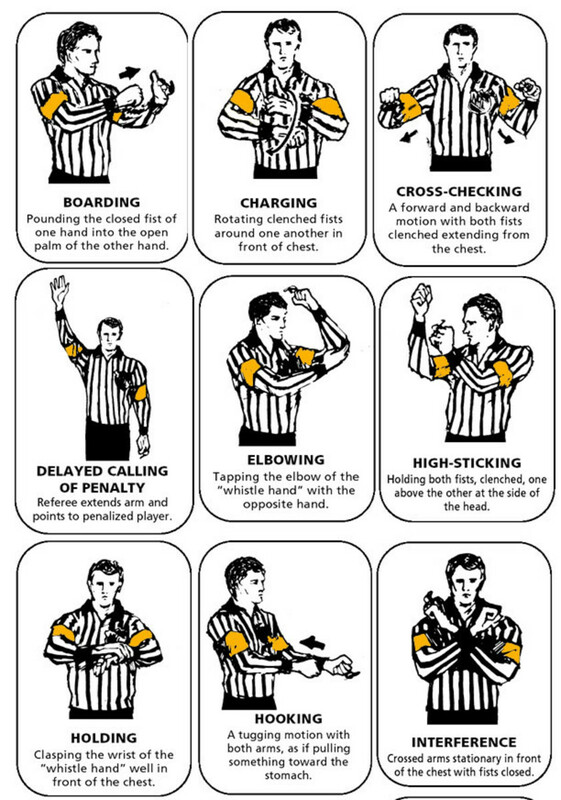 I found a good list of all NHL penalties onAi??wikipedia.com. Major penalties are called in the exact same way as minor penalties. The two differences between a minor and a major penalty are the time served by penalized players and what happens when the team with the ensuing power play scores. Minor penalties are 2 minutes each (in the case of 4 minute high sticking, it is really 2 high sticking calls stacked on a player.) A major penalty has a 5 minute timer. Also, when a team with a penalized player in the box serving his minor penalty gets scored on, the penalty ends and the player comes out. Not so with a major penalty. Regardless of how many goals are scored against the penalized player’s team, he stays the box in until his time is up. Boarding:Ai? ?Very similar to the minor version above, a player who hits a defenseless player from behind into the boards has committed boarding. If the referee determines that the hit was too much and excessive, he can upgrade the call to a major penalty. I have seen some pretty malicious boarding calls, and (like in the case of high sticking) the player was charged with a double major. This would best be described as two 5 minute major calls stacked, making it a 10 minute penalty. That player also receives a game misconduct. I will explain that below. Roughing:Ai? ?Again, like its 2 minute minor variety, roughing can have a dark side too. If a player gets out of control and starts hitting others high, such as around the head with the intent to injure that player, they will likely see a 5 minute major for roughing. Players, hopefully, are aware of others around them and don’t get hit unaware. A solidly placed check on a player not looking up is not considered too rough in most cases. The referee will decide if a player is out of line and is just playing too rough for the safety of the other team. Fighting:Ai? ?Players push each other and look like they are fighting all game. They tackle and rub their gloves in each others’ face all day, and this is usually not called. Emotions run hot in hockey. Fighting is called only when gloves are removed or dropped. Once a player has dropped his gloves with the intent to fight, he will get a 5 minute major for fighting. The instigator may get an extra 2 minute minor for trying to pick the fight. Most often, when there are offsetting major penalties (in other words, two players tussle, they both go off… the penalties offset), both teams can still skate 5 on 5 (or what ever the player count was before the fight happened). Fighting is the most common major penalty in the NHL. Fast breaks are common in many sports and can best be described as the opportunity for an offensive player to rapidly approach the goal of an opponant where the closest defenders are behind him. In hockey, if a player is tripped, held, or hooked from behind, and it is determined by the referee that the offensive player would have made it to the net to attempt a shot, he may waive the 2 minute penalty time and award the offensive player with a penalty shot.